David and Elizabeth Weinlick’s life together began like a reality TV show, blossomed into two decades out of a romance novel, and now seems destined to end in tragedy. 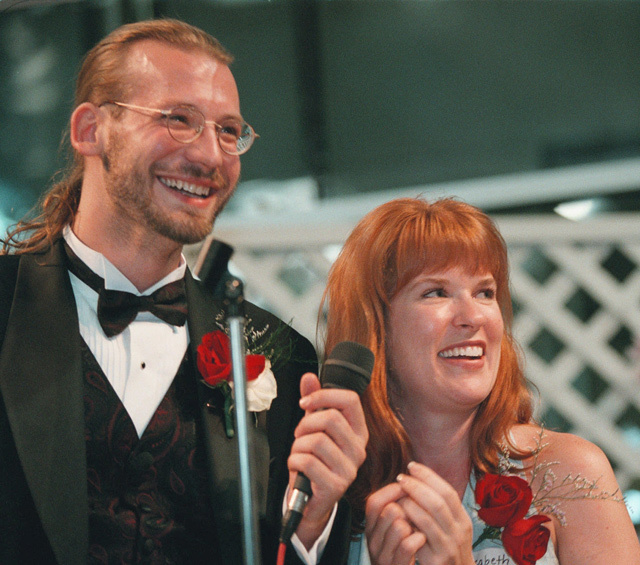 David Weinlick and Elizabeth Runze were strangers when they said “I do” in front of thousands of shoppers and in the national spotlight at Minnesota’s Mall of America in June 1998. Now it seems the thing that will end what they call “our great love story” is cancer, after David was diagnosed with terminal and inoperable stage IV colon cancer. They were brought together not by love or mutual attraction but by friends and family, whom David tasked with finding him the right bride. Nineteen years and four children later, it’s obvious Elizabeth, or Bethy, was the right choice. The Weinlicks bristle at even the suggestion that their union wasn’t meant to last (“It was a spectacle wedding, but not a spectacle marriage,” David quips). “Basically, our fairy tale romance is being cut short by decades. We’re hoping that we get Dave for another year. We’ll be lucky if we get that,” Bethy told The Associated Press. The Weinlicks, both 47, will write their final chapter together in the mostly ordinary way their lives have unfolded since their unusual marriage. There will be family gatherings, a high school reunion, books to read and binge-watching “The West Wing.” On Friday, they will return to the same spot where they were married at the Mall of America to renew their vows — an event that will double as a fundraiser for the Angel Foundation, which has helped their family and countless others suffering from cancer with financial help and free camps for children. Their arranged marriage started with an offhand joke: David told nosy relatives and friends he would be married June 13, 1998, never mind the unknown bride. As the date approached, he enlisted friends and family to help find one. They shot a commercial, placed advertisements and did countless television interviews, eventually soliciting inquiries from hundreds of women. David’s friends grilled the applicants with questions. As the field narrowed to two dozen women, Bethy stood out to his screeners because she showed she was willing to build and work on a relationship. They overwhelmingly chose Bethy, and the pair was married that day at the megamall, having met briefly just twice before — as Bethy picked up a questionnaire, then dropped it off. The commitment to a relationship that made Bethy David’s surprise bride has also been the key to their long marriage, the pair said. David was diagnosed in March, and the cancer had already spread to his liver. Bethy quit her job as a nurse soon after, while David had left his work for the state Democratic-Farmer-Labor party years earlier. After a few rough months, there’s still plenty of laughter in the Weinlicks’ house in suburban St. Paul — another key to a happy marriage, they said. But Bethy can’t help but cry as she pictures the unfulfilled future she had drawn up for them: building an empty nest when their youngest child leaves home or road trips on a motorcycle together.